Is the death of the CD looming? Compact disc album sales continue to be on the decline, even as digital downloads increase in popularity. (CNN) -- If you think the musical compact disc is dying or dead, you're probably younger than it is. "Show me a teenager buying a Susan Boyle album on CD and I'll show you someone buying a gift for their grandparent -- for Christmas," jokes Billboard senior chart manager and analyst Keith Caulfield. "There is definitely an age component to the consumption of music." As the music industry as a whole struggles in a down economy and direct download business models like iTunes flourish, the compact disc -- which was commercially introduced in 1982 -- has the appearance of going the way of vinyl. And contrary to the recent declaration of singer Prince -- who said that the Internet is dead and released his latest CD for free via European newspapers -- there's some evidence that consumers aren't as enamored with ripping the cellophane off that new CD as they once were. 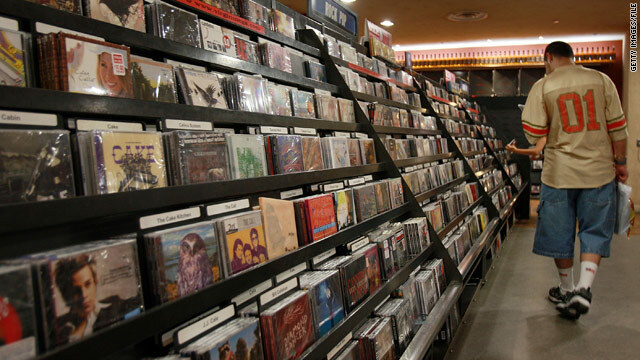 According to data from Nielsen SoundScan, in 2007 CDs accounted for 90 percent of album sales in the United States, with digital accounting for the other 10 percent. Just two years later, that number had shifted to 79 percent CDs and 20 percent digital, with the remaining percentage point being made up of vinyl and other media. Billboard's Caulfield said that so far this year, about 44 million digital albums have been sold, compared with 40 million during the same time frame last year. But while digital sales have increased slightly, CD sales have dropped from 147 million last year to 114 million this year for the same time period. Caulfield stops short of speculating on a date when CDs might be phased out, but he does see similarities with the history of other media. "Vinyl was the predominant configuration from the '50s and the '60s all the way up through the early '80s, and then cassettes became the predominant format from the early-mid '80s to the very early '90s," he said. "Then CDs became the predominant format and cassettes really didn't go away until a few years ago. It's kind of a natural progression, to a degree." That's not to say that some artists aren't still selling well. Country group Lady Antebellum has so far racked up 2.4 million in album sales -- both CD and digital -- making them the top-selling act so far for 2010. In second place is teen phenom Justin Bieber, with 1.4 million. "When an artist like a Drake or Eminem sells a bunch of albums, that shows that there are a lot of people that really want to spend money and give money to the artist that they are really, truly a fan of," Caulfield said. "The younger an artist skews in terms of who they appeal to, you'll see a larger share of their album sales tilt towards digital." One obvious benefit of digital downloads is their ability to scratch an immediate itch. Caulfield observes shows like Fox's "Glee" make songs almost instant hits because "they have already heard and liked the song by the time they download it." Paul Grein, who writes the "Chart Watch" column for Yahoo.com, agrees, seeing hope for the music business in the success of "Glee" and "American Idol," which have helped spike downloads. Despite the CD's decline, Grein believes the format will be around for the foreseeable future. "I think it's becoming less of a mass-market item and kind of a niche product that caters to a small but loyal following," he said. "But there are enough cases where we are seeing albums that are selling in big numbers that I think they will be around for a while." Younger-skewing artists, such as singer-rapper Ke$ha, enjoy a larger slice of the digital pie than older-skewing artists such as James Taylor, he says. Indeed, the format isn't the point, he said. In 100 years, recorded music has gone from cylinders to shellac 78s to vinyl LPs to cassettes, CDs and now digital downloads. Through it all, listeners still crave tunes. "Music is definitely still in fashion," he said. "It's all around us."